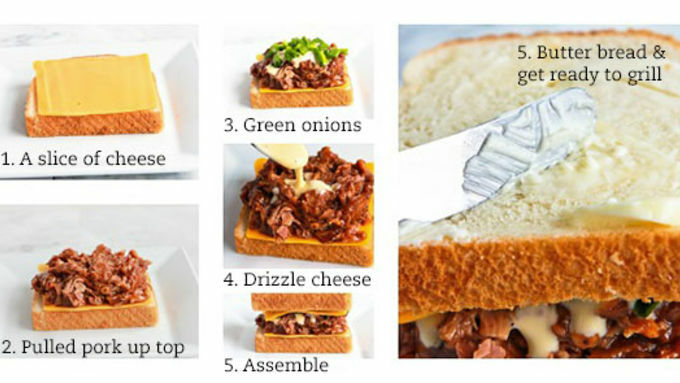 Layer cheese and pulled pork on top of one slice of bread. Drizzle with Progresso™ Soup Starter. Sprinkle with green onions. Add the second slice of cheese on top. Top with final slice of bread. Butter the top of the bread with 1 tablespoon of butter. Melt the second tablespoon of butter in a grill pan over medium-low heat. Gently place the sandwich in the hot grill pan. Cover with a lid and cook until the bottom layer of cheese is melted. 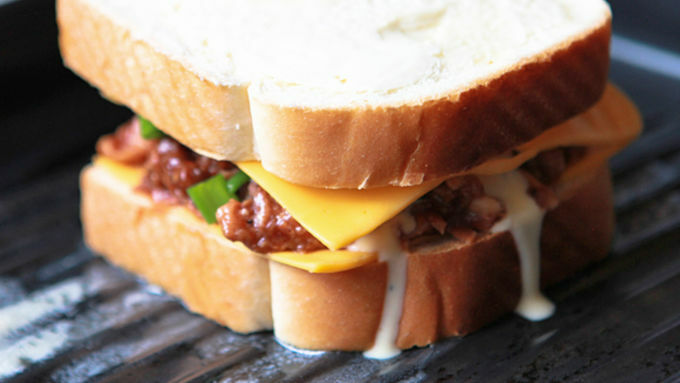 Flip the sandwich and cook on the second side until the cheese is melted. Remove from pan, transfer to plate. Slice, serve immediately, and enjoy! Whoever thought of putting cheese between two slices of bread, slathering the bread with butter, then melting it all to make a sandwich is at least as epic as Gordon Ramsay. Or Julia Child. Or the Real Housewives of Atlanta. Because this simple sandwich stands the test of time, taste, and style. When it comes to grilled cheese, there's more than one way to put a stiletto on the sandwich. We found four recipes that do just that. How one can melt so much beauty in the center of a single sandwich is worth celebrating! We'd give these recipes their own reality show – if only we weren't so dead-set on eating them immediately. Everyone loves crockpot pulled pork (check out our favorite recipes here. 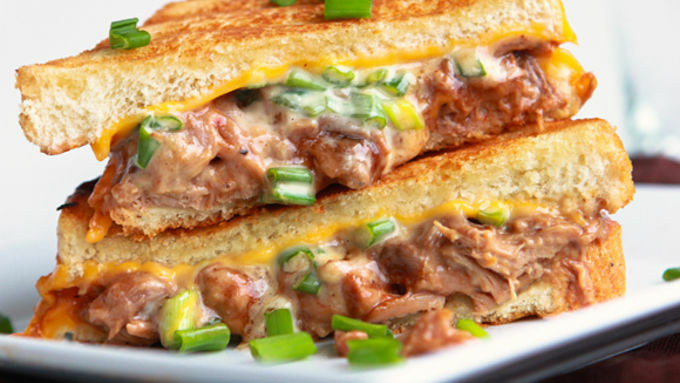 Now you can use those leftovers to make this unbelievably delicious Crockpot Pulled Pork Grilled Cheese sandwich. Rich and cheesy, this recipe will become a fast favorite. Serve with a mug of frosty beer and some chips for the ultimate pairing. To make a perfect grilled cheese, always set your stove to medium low. And make sure to place the sandwich in a hot pan. You don't want set it into a cold pan and then turn the heat on. Doing so may melt the cheese, but it won't give you that gorgeous golden-brown color that a hot pan will. The other secret, especially with a sandwich this big, is to place a lid cover over the skillet. It doesn't have to fit the skillet. Anything that can help contain the heat and more evenly distribute it through the entire sandwich. It's time! Pull your sandwich off of the stove and transfer to a favorite plate. Allow it to cool ever so slightly (if you can resist diving in). Slice your sandwich in half. Ogle all that grilled cheesy goodness. Then prepare to bite into it and fall into pulled pork heaven.